Violet Ohl was determined to break the cycle – the tradition of poverty that left so many people in her family and community all living in the same place, with no real hope for a better future. The young woman from Springfield had a plan and a dream, and she’s following through. She’s the first person in her family to attend college, thanks to that determination and the help and support she’s finding at Southern Illinois University Carbondale. 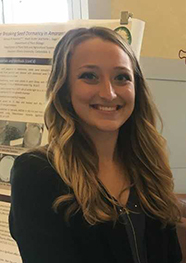 She’s active with the campus branch of the Society of Women Engineers, helping with adopt-a-spot cleanups and other projects, and recently attended a national conference in Minneapolis. 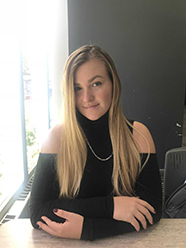 The first-generation college student is also a math tutor for Trio Student Support Services, the program to which she gives much credit for helping her succeed at the university. SIU is recognizing students like Ohl and the challenges they face as groundbreakers by celebrating First-Generation College Student Awareness Day on Thursday. The day includes several special events hosted by Trio and the First Scholars program. The festivities begin with “Kick-off with Coffee” at Starbucks in the Student Center from 8 to 10 a.m.
A calendar of the day’s events can be picked up between 2 and 4 p.m. today (Nov. 7) at the First Scholars Office, located in Room 137 of the Student Services Building or the Trio Student Support Services Office, located in Room 216 in Woody Hall. The first 50 first-generation SIU students who pick up a calendar of events will receive a coupon good for a free coffee drink valued at up to $7. Stop by the first gen Saluki informational table at the Saluki Hall of Fame in the Student Center from 11 a.m. to 2 p.m. Thursday to get more information about the support services, programs and resources available to students who are the first in their families to go to college. Faculty, staff and community members are also encouraged to stop by and write an encouraging message for first-generation students on the wall. And everybody can take a selfie next to the wall. Everyone is invited to attend a panel discussion as faculty, staff and students share their very own stories about being first-generation college students. It’s your chance to learn more about the challenges and successes these students encounter. The discussion is set for 3:30-4:30 p.m. Thursday in the Student Center’s Kaskaskia/Missouri rooms. Refreshments will be served. She said she began counseling due to some past life experiences and it changed her outlook and approach to life, convincing her she wanted to help other people and have a positive impact on them, something that would require a college education. A representative from SIU visited her school and she stopped by out of curiosity, telling the representative that although she had a great 4.0 GPA, her ACT score was only average. She wondered if there were any scholarships available. Soon she connected with the First Scholars program and felt becoming a Saluki was meant to be. Knowing you want to go to college is a far cry from doing everything you need to do to get there and then succeeding, Boester notes. Rashawn Overton, a freshman who plans to become an electrical engineer, agrees. No one in the Rock Island, Illinois, man’s family had ever attended a university, but teachers, mentors and family members encouraged him to do so. Ohl, Overton and Boester say they and other first-generation Salukis have found an incredible support system at SIU. 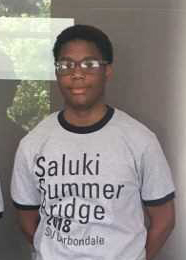 Overton participated in the Saluki Summer Bridges, a program that brings first year students to campus for two weeks during the summer before school starts to help them get acquainted with college life and smoothly make the transition. He and Ohl praised Renada Greer, director, and the rest of the Trio staff for all of their support and assistance. The Trio program helps first-generation, income-eligible students and students with disabilities by providing group and individual support services to help them meet their educational, social and personal needs while reaching their full academic potential. Boester was also effusive in her praise for Cristina Castillo, coordinator of the First Scholars program. Fellow Salukis, faculty and staff across campus and involvement in registered student organizations have also helped these trailblazers, they say. SIU’s event is part of a national First-Generation College Celebration sponsored by The Center for First-Generation Student Success, an initiative of NASPA and The Suder Foundation. “We want to celebrate first-generation college students, who comprise a large segment of SIU’s student body, and recognize the barriers they face and how they are overcoming them,” Greer said. She said a lack of financial support is quite common, as there’s usually a gap between financial aid and what first-generation college students and their parents can pay. Thus, these students typically have to work more hours than traditional students, leaving less time to focus on academics. “There are other challenges as well, but we are seeing these students work hard and succeed,” Greer said. And that’s why the awareness day is important to Boester.